The average nonunion worker earned about 20 percent less than the average unionized employee worker in wages alone. The average nonunion worker earned about 33 percent less than the average unionized employee in total compensation. Some of the most important benefits that workers get from Union membership are impossible to put a price tag on: representatives in the workplace of our own choosing, an active, collective voice to bargain over working conditions, and due process on the job. As union members, we know that collective bargaining is the best way to promote basic, democratic principles of fairness and dignity at work. But being in a union confers significant economic benefits as well. Unions have historically been the most effective institutions in our society at making sure the economic gains that workers help to create are shared widely rather than being channeled solely to the executive suite. 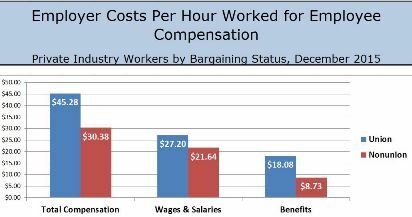 The data below illustrates “The Union Difference” and shows why more and more people are joining unions today.